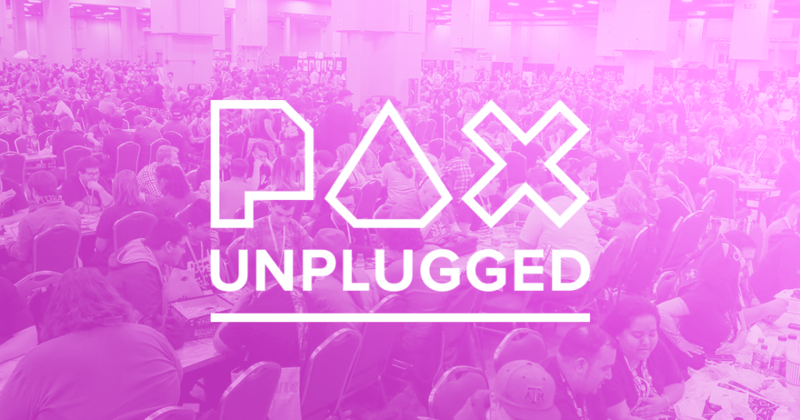 I’ve been looking forward to attending PAX Unplugged for a while. My major client, John Wick Presents, will be taking me to the convention to help sell 7th Sea games and related coolness. (I’ve got a two-minute demo down cold, which could expand to a five-minute demo with interest, and can talk about the game for as little or as long as interest remains.) While there are several things I want to see and do, I think this will be a rather laid-back event for me. The show is in Philadelphia, and while it’s a bit lighter on the roleplaying side of things than say, Gen Con is, there are still a lot of people and colleagues I’d like to meet up with (and merchandise to check out). With the number of events scheduled, this feels like a larger RinCon, mainly by having a huge open gaming library (the no pre-registration for events is odd), and RinCon was only up to 800+ attendees. It appears PAX Unplugged is simply taking that small convention idea and upscaling it. Saturday tickets are sold out, but I really have no idea what number “sold out” translates to. Signups for tournaments and events are anywhere from 16 players to a few dozen. Smaller than PAX East? That’s the impression I’m getting. The majority of the time, I’ll be at the John Wick Presents booth, #438. I’ll be there until 2 on Friday and Saturday, and after 2 on Sunday, if you’d like to stop by and say hello! Also in the same booth island are my good friends at Magpie Games (#442) and the Indie Game Developer Network (#343) — I’ve done work for a good chunk of the IGDN crowd and have worked on a lot for Magpie — and then there’s the Modern Myths game store with boxes and boxes of indie roleplaying games (#339). Saturday at 2, I’ll be heading to Games on Demand and try to get into either the Apocalypse World or the InSpectres game. If neither one goes off, I’ll have Primetime Adventures, Lady Blackbird, and maybe Tales from the Loop to run. At 4 that day, if I don’t get into any of those games, I might head to the main theatre, where Shut Up & Sit Down are recording, but it’s really doubtful I’ll do that as (1) they’re recording and I’ll probably watch it when it gets released, (2) the question and answer segment at the end of their usual panels never really holds my interest, and (3) it’s ninety minutes long. I’ll probably head to SU&SD’s other event at 9pm that night, the “Goodtime Fun Meetup”, which should have some large-group games. Sunday morning is relatively open. I’ll possibly sit in on a Sentinels Comics RPG demo. Possibly go to a Dominion tournament. Maybe go to a RoboRally tournament. But then I’m in town all evening, not having to worry about travel until the next morning. When I’m not in those, I’ll probably be in open gaming, hopefully having fun! Merchandise-wise, there’s not a lot I’m on the lookout for, but I will be stopping by the Fantasy Flight Games booth to see if they’ve got early versions of Fallout available. Also: is this the year I finally pick up The Adventures of Baron Munchausen? If you’re attending, ping me at @denaghdesign on twitter, or swing by the JWP booth! I hope to see you there!